Background: Brain imaging studies detect abnormalities in normal-appearing white matter in patients with MS. Objective: To investigate the histopathologic basis for these changes in autopsy tissue from a patient with MS with 9 months’ disease duration and a terminal brain stem lesion. Methods: The brain stem and spinal cord were analyzed ultrastructurally and immunocytochemically for axons, myelin, and activated microglia/macrophages. Results: Pathologic findings were consistent with a terminal inflammatory demyelinated lesion at the cervicomedullary junction. The ventral spinal cord column, containing descending tracts, exhibited 22% axonal loss at segment C7, but grossly normal immunostaining for myelin. Confocal and electron microscopy revealed myelin sheaths without axonal content and initial stages of myelin degradation by activated microglia/macrophages among intact myelinated axons. Axonal number and appearance was normal in ascending sensory tracts. Conclusions: These studies confirm axonal degeneration in the absence of myelin loss as one histopathologic correlate to abnormal MR findings in patients with MS. Recently, the development of MRI T2-hyperintense abnormalities along the corticospinal tract subsequent and distal to acute T2-hyperintense brain lesions was reported to represent Wallerian degeneration.17 However, direct histopathologic evidence of axonal degeneration in NAWM remote to acute MS lesions has not been reported. The patient was a 43-year-old man with the clinical onset of relapsing-remitting MS (RR-MS) 9 months before death from respiratory arrest, presumably as a result of abrupt loss of automatic breathing while asleep (Ondine’s curse). Briefly, symptom onset occurred in September 1997 with the development of gait ataxia and oscillopsia over 1 week. These symptoms spontaneously improved before the development of diplopia and mild quadriparesis in December 1997. He received treatment with corticosteroids and was referred to the Cleveland Clinic Foundation. Diagnostic evaluation revealed cranial MRI changes typical of early MS, the presence of spinal fluid oligoclonal bands, vertical nystagmus, mild spastic quadriparesis (right > left), severely weak hand intrinsic muscles, a spastic–ataxic gait, minimal sensory changes, and the ability to walk unassisted. Shortly after this initial evaluation, he developed orthopnea and paroxysmal nocturnal dyspnea associated with increased oscillopsia and diplopia, and worsening gait. During admission for evaluation and treatment, he became progressively tachypneic and required tracheal intubation on March 16, 1998. Following a 7-day course of IV methylprednisolone (1,000 mg/day), he improved and was extubated on March 23, 1998. Following discharge from the hospital, he was again walking unassisted, but his condition worsened as the dosage of oral steroids was decreased. This resulted in readmission on May 8, 1998 during the evening shift. Shortly after transfer to the hospital floor, he was found unresponsive in asystole. Despite resuscitation, he was declared brain dead on May 11, 1998. CT imaging on May 11, 1998 revealed loss of all gray–white junctions, bilateral basal ganglion infarctions, bilateral superior cerebellar and midbrain infarction, and obstructive hydrocephalus—all findings consistent with severe anoxic brain injury. The protocol was approved by the Cleveland Clinic Institutional Review Board. Informed consent was obtained from the patient’s family to perform research on CNS tissue postmortem. The spinal cord and brainstem were removed through a rapid autopsy procedure, cut into 2-cm segments, and immediately fixed in 4% paraformaldehyde (PFA). Postmortem time was 4 hours, given the fact that after the terminal respiratory arrest causing anoxic brain injury, the patient was on respiratory support for approximately 72 hours before death. A 52-year-old man and a 63-year-old woman without neurologic disease served as controls. The fixed tissue was cryoprotected in glycerol and frozen. Free-floating sections (30-μm-thick) were cut on a sliding-freezing microtome (Microm, Heidelberg, Germany) and immunostained by the avidin–biotin complex procedure and diaminobenzidine, as described previously.2,3⇓ Myelin basic protein (MBP; SMI-94), phosphorylated neurofilament (NF; SMI-31), and nonphosphorylated NF (SMI-32) antibodies were obtained from Sternberger Monoclonals (Baltimore, MD). Major histocompatibility complex (MHC) class II antibodies, a microglia/macrophage marker, were obtained from DAKO (Carpinteria, CA). For confocal microscopy, sections were incubated with two primary antibodies, incubated with fluorescein-conjugated and Texas red–conjugated secondary antibodies (Jackson Laboratories, West Grove, PA), and examined in a confocal microscope (Leica TCS-NT, Heidelberg, Germany). Axons were quantified as described previously.3 Triangulated areas in MS and control cross-sections (segments C6–7) that included ventral 28.5-degree sectors and dorsal 9-degree sectors were analyzed bilaterally (figure 1F). Axonal numbers and density were obtained using NIH Image (version 1.61, NIH, Bethesda, MD) and Adobe PhotoShop software (version 5.0, San Jose, CA). Figure 1. Phagocytic macrophages and activated microglia identify areas of fiber degeneration in the cervical spinal cord of the MS case. (A) In the ventral column (VC) of a control subject, major histocompatibility complex (MHC) class II antibodies stained resident microglia cells. (B) Large, rounded MHC class II–positive cells with short processes, characteristic of phagocytic macrophages, were prominent in the most affected ventral MS column. (C) The dorsal columns (DC) of the same section as in (B) contained MHC class II–positive resident microglia. (D and E) Neurofilament stained axons in the affected ventral column of the patient with MS (E) and a control subject (D). (F) Axons were quantified in four triangulated cervical (segments C6–7) spinal cord white matter areas using a computer-based morphometric system. (G) Total axon number in the four areas indicated in (F). Scale bars = 50 μm (A to C) and 25 μm (D and E). For electron microscopy, 2-mm-thick ventral cervical spinal cord segments (C6–7) were fixed with 2.5% glutaraldehyde and 4% PFA in 0.08 M Sorenson’s buffer, treated with 1% osmium tetroxide (4 hours), dehydrated, and embedded in Epon. Ultrathin sections were counterstained with uranyl acetate and lead citrate and examined by electron microscopy. Myelin bodies and activated microglia in NAWM. An active MS lesion characterized by lack of myelin and abundant MHC class II positive macrophages was present ventrally at the cervicomedullary junction (data not shown). MS lesions were not detected in other regions of the spinal cord macroscopically or in MBP-stained sections. However, myelin bodies were found among intact myelin sheaths throughout the cervical ventral column. These structures, representing collapsed myelin, were present bilaterally, but the density was relatively higher in one of the columns. Expression of MHC class II was similarly increased in the ventral columns. In these areas, MHC class II–positive cells were large, rounded, with short processes, characteristic of phagocytic macrophages (see figure 1B). In contrast, MHC class II–positive cells in the lateral and dorsal columns (see figure 1C) or in spinal cords from control patients (see figure 1A), were small, process-bearing resident microglia. Axonal loss in the ventral column containing descending tracts. The number of white matter axons (see figure 1,D and E) was quantified using a triangulation method3 (see figure 1,F and G). 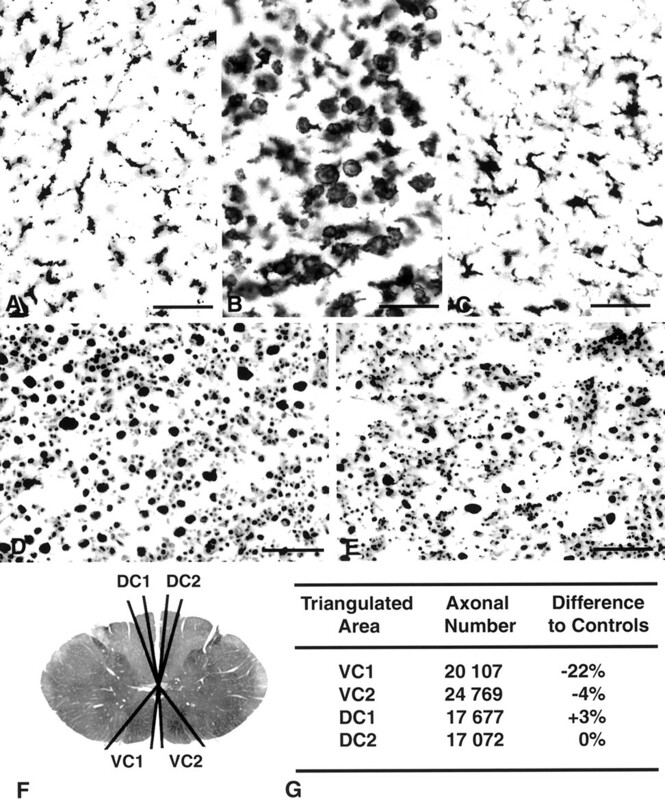 In the most affected ventral column, the number of axons within the triangulated area was 20,107 (22% reduction compared with control subjects). The white matter area was 1.14 mm2 (19% reduction) and the axonal density was 17,637 axons/mm2 (3% reduction). The contralateral ventral column contained 24,769 axons (4% reduction compared with control subjects) within 1.37 mm2 (3% area reduction) at a density of 18,079 axons/mm2 (1% reduction). In triangulated areas from the dorsal columns, the number of ascending axons was similar to control subjects bilaterally (see figure 1G). Empty myelin profiles in NAWM. Double labeling for myelin and NF or MHC class II, combined with confocal three-dimensional reconstruction, revealed degeneration of fibers in the cervical ventral column. In cross-sections, empty myelin profiles and myelin bodies occurred among intact myelinated axons (figure 2A). Activated microglia cells surrounded many of these myelin structures (see figure 2B). Primary demyelination was not detected. In longitudinal sections, aberrant myelin profiles were resolved as discontinuous myelin ovoids lacking NF-positive axons (see figures 2, C and D). In the lateral and dorsal columns, or in spinal cords from control patients, all myelin sheaths were structurally intact and contained NF-stained axons. Figure 2. Descending spinal cord axons distal to the brain stem lesion undergo degeneration. Confocal images of the ventral cervical column stained for myelin (green), neurofilaments (A, C, and D; red) or the activated microglia/macrophage marker major histocompatibility complex (MHC) class II (B; red). In cross-sections (A), numerous myelin profiles lacking axons (arrowheads) were detected among intact myelinated axons. Some appeared as “empty” myelin circumferences (lower right profile), while others were composed of collapsed myelin membranes. Signs of primary demyelination were not detected. Activated class II cells (B; red; arrows) often contained phagocytosed myelin (green). Overt stripping of myelin from internodes was not observed in this region. In longitudinal sections (C), fibers undergoing degeneration appeared as rows of myelin ovoids (green; arrows) between intact myelinated axons. At higher magnification (D), the ovoids contained disrupted myelin membranes and lacked axonal staining (red). All images represent projections of three to five contiguous confocal slices. Scale bars = 25 μm. Electron microscopy extended the confocal microscopy data. 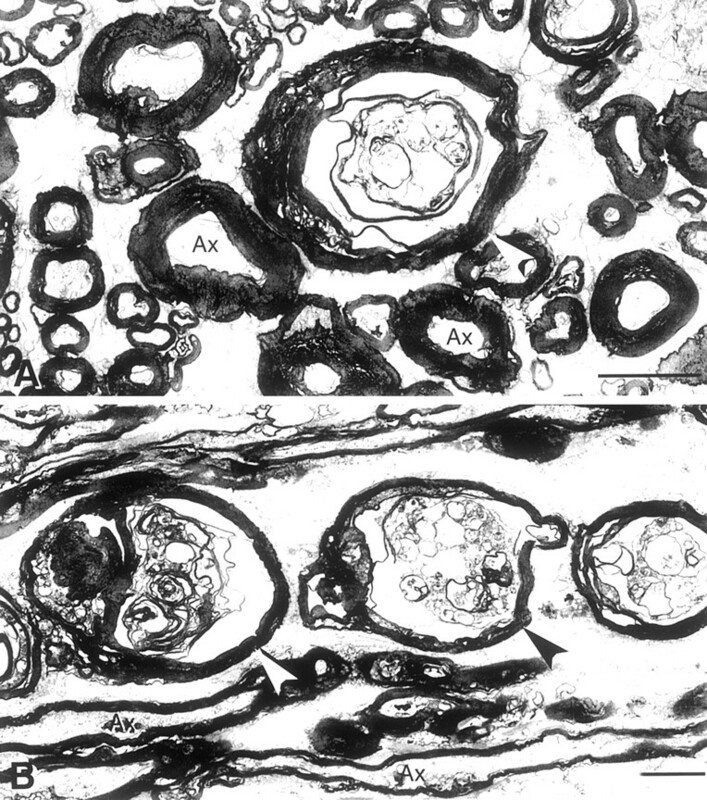 Myelin ovoids lacking discernible axons and collapsed myelin figures containing membranous debris were observed in the ventral column (figure 3, A and B). There were no ultrastructural signs of primary demyelination. Figure 3. Electron microscopy confirms axonal degeneration in the ventral cervical column of the MS case. In both cross-section (A) and longitudinal section (B), myelin ovoids lacking axons (arrowheads) were detected among intact myelinated axons (Ax). In longitudinal sections (B), these ovoids often lay in rows. Scale bars = 2.5 μm. These results provide direct evidence that neuronal or axonal injury at early stages of MS can cause significant axonal loss in NAWM distal to the lesion. In this case, myelin was relatively preserved despite 22% axonal loss. Ultimately, CNS myelin can remain for years and contribute to a grossly normal appearance of the affected white matter. Importantly, the data suggest that irreversible axonal loss with considerable retention of slowly degenerating myelin is one histopathologic correlate to NAWM abnormalities observed in patients with MS by MRI and MRS techniques. In active MS lesions, neuronal or axonal injury is likely to be caused by inflammatory substances such as proteolytic enzymes, cytokines, oxidative products, and free radicals produced by activated immune and glial cells.18 Transected CNS axons will undergo rapid degeneration distal to the site of injury.9,10⇓ Although MS lesions were not found in the spinal cord postmortem, the ventral column containing descending corticospinal, vestibulospinal, and reticulospinal tracts exhibited a 22% axonal loss. The dorsal columns however, containing ascending sensory fibers, had normal axonal numbers and morphology. This patient experienced respiratory failure 2 months before death caused by a brain stem lesion after a short history of RR-MS. Postmortem, an active MS lesion was observed ventrally at the cervicomedullary junction. This lesion could account anatomically for the development of downbeat nystagmus, spastic quadriparesis, and the patient’s terminal event as a result of Ondine’s curse. This lesion could also account for the loss of axons distally. In addition, multiple periventricular abnormalities observed on MRI scans 3 months before death may have caused loss of corticospinal axons. Because the morphology of adjacent fibers in the ventral column and in other areas of the spinal cord was extremely well preserved, we consider it unlikely that the pathologic changes are the result of autolysis during the 72 hours on respiratory support between the terminal respiratory arrest and death. Together, the data support specific dropout of descending spinal cord axons caused by proximal axonal damage in acute brain stem or periventricular MS lesions. Another interesting question relates to the immunologic consequences of axonal degeneration in NAWM. Conceivably, the process of slow myelin degradation may lead to a secondary inflammatory response, with additional cycles of autosensitization. The process of epitope spreading has been well documented in animals with experimental autoimmune encephalomyelitis and patients with MS,24 but the mechanisms have not been clarified. The process of slow myelin degradation secondary to axonal degeneration may drive epitope spreading and perpetuate the autoimmune cascade, resulting in recurrent multicentric inflammatory CNS lesions. Although axonal loss correlates with reduced NAA levels in chronic MS lesions,3 decreased tissue NAA may reflect several cellular events such as altered neuronal activity or local metabolic changes due to CNS inflammation.3-5,16⇓⇓⇓ Interestingly, magnetization transfer imaging abnormalities in NAWM can precede the formation of new lesions in MS.25 Methods that distinguish axonal degeneration distal to sites of transection from other changes in NAWM are therefore urgently needed because they may have important impact on the understanding of MS pathogenesis. Supported by NIH grants NS35058 and NS38667, and by a pilot study grant (B.D.T.) and a postdoctoral fellowship (C.B.) from the National MS Society. The authors thank Dr. Ansi Chang, Renata Klinkosz, Sara Trapp, and Dr. Xinghua Yin for assistance with the analysis. Ferguson B, Matyszak MK, Esiri MM, Perry VH. Axonal damage in acute multiple sclerosis lesions. Brain. 1997; 120: 393–399. Trapp BD, Peterson J, Ransohoff RM, Rudick R, Mörk S, Bö ; L. Axonal transection in the lesions of multiple sclerosis. N Engl J Med. 1998; 338: 278–285. Bjartmar C, Kidd G, Mörk S, Rudick R, Trapp BD. Neurological disability correlates with spinal cord axonal loss and reduced N-acetyl aspartate in chronic multiple sclerosis patients. Ann Neurol. 2000; 48: 893–901. Arnold DL, Reiss GT, Matthews PM, et al. Use of proton magnetic resonance spectroscopy for monitoring disease progression in multiple sclerosis. Ann Neurol. 1994; 36: 76–82. Matthews PM, De Stefano N, Narayanan S, et al. Putting magnetic resonance spectroscopy studies in context: Axonal damage and disability in multiple sclerosis. Semin Neurol. 1998; 18: 327–336. De Stefano N, Matthews PM, Fu L, et al. Axonal damage correlates with disability in patients with relapsing-remitting multiple sclerosis. Results of a longitudinal magnetic resonance spectroscopy study. Brain. 1998; 121: 1469–1477. Lee MA, Blamire AM, Pendlebury S, et al. Axonal injury or loss in the internal capsule and motor impairment in multiple sclerosis. Arch Neurol. 2000; 57: 65–70. Gonen O, Catalaa I, Babb JS, et al. Total brain N-acetylaspartate. A new measure of disease load in MS. Neurology. 2000; 54: 15–19. Griffin JW, George R, Lobato C, Tyor WR, Yan LC, Glass JD. Macrophage responses and myelin clearance during Wallerian degeneration: relevance to immune-mediated demyelination. J Neuroimmunol. 1992; 40: 153–166. Aldskogius H, Kozlova EN. Central neuron-glial and glial-glial interactions following axon injury. Prog Neurobiol. 1998; 55: 1–26. Fu L, Matthews PM, De Stefano N, et al. Imaging axonal damage of normal-appearing white matter in multiple sclerosis. Brain. 1998; 121: 103–113. Ganter P, Prince C, Esiri MM. Spinal cord axonal loss in multiple sclerosis: a post-mortem study. Neuropathol Appl Neurobiol. 1999; 25: 459–467. Evangelou N, Esiri MM, Smith S, Palace J, Matthews PM. Quantitative pathological evidence for axonal loss in normal appearing white matter in multiple sclerosis. Ann Neurol. 2000; 47: 391–395. 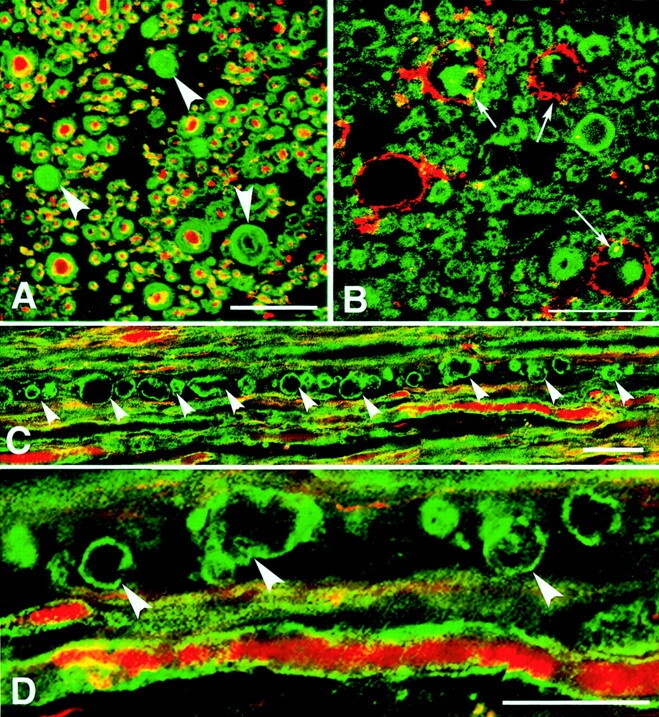 Lovas G, Szilágyi N, Majtényi K, Palkovits M, Komoly S. Axonal changes in chronic demyelinated cervical spinal cord plaques. Brain. 2000; 123: 308–317. De Stefano N, Narayanan S, Matthews PM, Francis GS, Antel JP, Arnold DL. In vivo evidence for axonal dysfunction remote from focal cerebral demyelination of the type seen in multiple sclerosis. Brain. 1999; 122: 1933–1939. De Stefano N, Matthews PM, Arnold DL. Reversible decreases in N-acetylaspartate after acute brain injury. Magn Reson Med. 1995; 34: 721–727. Simon JH, Kinkel RP, Jacobs L, Bub L, Simonian N. A Wallerian degeneration pattern in patients at risk for MS. Neurology. 2000; 54: 1155–1160. Hohlfeld R. Biotechnological agents for the immunotherapy of multiple sclerosis. Principles, problems and perspectives. Brain. 1997; 120: 865–916. Filippi M, Tortorella C, Bozzali M. Normal-appearing white matter changes in multiple sclerosis: the contribution of magnetic resonance techniques. Mult Scler. 1999; 5: 273–282. Wolinsky JS, Narayana PA, Fenstermacher MJ. Proton magnetic resonance spectroscopy in multiple sclerosis. Neurology. 1990; 40: 1764–1769. Narayana PA, Doyle TJ, Lai D, Wolinsky JS. Serial proton magnetic resonance spectroscopy imaging, contrast-enhanced magnetic resonance imaging, and quantitative lesion volumetry in multiple sclerosis. Ann Neurol. 1998; 43: 56–71. Tourbah A, Stievenart JL, Gout O, et al. Localized proton magnetic resonance spectroscopy in relapsing remitting versus secondary progressive multiple sclerosis. Neurology. 1999; 53: 1091–1097. Kidd G, Andrews SB, Trapp BD. Axons regulate the distribution of Schwann cell microtubules. J Neurosci. 1996; 16: 946–954. Tuohy VK, Yu M, Yin L, et al. The epitope spreading cascade during progression of experimental autoimmune encephalomyelitis and multiple sclerosis. Immunol Rev. 1998; 164: 93–100. Filippi M, Rocca MA, Martino G, Horsfield MA, Comi G. Magnetization transfer changes in the normal appearing white matter precede the appearance of enhancing lesions in patients with multiple sclerosis. Ann Neurol. 1998; 43: 809–814.